We spent over 29 hours researching and testing 12 different types of bird cages and found that number of doors, sturdiness, and materials used in construction were most important. The Hagen Vision Bird Cage scored way above the other cages we researched and is easily our top pick. We loved the stylish look of this bird cage that resembles a cute house with the pointed roof line. It comes with perches and cups so we had everything we needed. The spacing of the wires is perfect, not too wide to get a leg or beak stuck, but not so close that it hampers their vision. Birds are an enjoyable pet to have around. Even though they may not be as “cuddly” as a dog or cat, they have their own special qualities that make them really nice to own. Having a nice home for your bird is important to their overall health. You want to have a cage that accommodates their size and that gives them plenty to do. There are all types and sizes of bird cages on the market these days, from small ones that can hold one or two very small birds, to the extra large cages that are designed for big parrots. These top rated bird cages we have reviewed have great designs and are perfect for many different breeds of birds from finches to cockatiels or larger. All of them come equipped with everything your bird needs including food and water cups and perches. If you’re looking for a great home for your bird or birds, we’re certain one of these top rated cages may be exactly what you’re looking for. If you’re looking for a home for your lovebirds, canaries, parakeets or finches, this is the perfect thing for them. The Hagen Vision 2 bird cage gives your birds lots of room to move around and enjoy their home without being crowded. The unique design of the Vision 2 means seed waste and debris stays inside the cage rather than flying around your home. Another contributing factor to making this cage much easier to clean is where the food and water cups are located. This cage has a very deep base and small wire for maximum protection for your treasured pets. It comes with green perches and green food and water cups as well. The base measurements are 24” x 15” x 20.5”. Birds are beautiful but they can definitely be mess makers with how they eat and flapping their wings which can stir up debris that can end up on the table or floor around the cage. The easy to open doors make adding food and water or taking your bird in and out of the cage much easier. The sleek and attractive white, green and clear color scheme looks great no matter what your décor is. If you have several small birds or a couple of larger ones, like lovebirds or cockatiels, they will love the Vision 2 bird cage. If you have larger birds, this YML Square Playtop Cage is perfect. With a large swing out door for easy entry and exit, and 5/8” spacing between the bars, your large bird will be perfectly at home. The removable grate and slide out plastic tray on the bottom make cleaning easy. This convenient and attractive cage includes 2 feeder doors, 2 plastic cups and 2 perches. Measurements of the cage are 20” x 20” and are 28.5” high with the top closed. The top of the cage has a playtop for your large bird to climb up and entertain themselves on. The playtop consists of a large perch for them to sit on but you can purchase additional things to go on top if you desire. The top of the cage is a great way for your bird to get out for awhile without being in unsafe or unsupervised areas. This larger cage is not big enough for extremely large birds like Macaws, but for the smaller breeds of parrots, cockatiels and others it is the perfect size that will not leave them feeling cramped and uncomfortable. 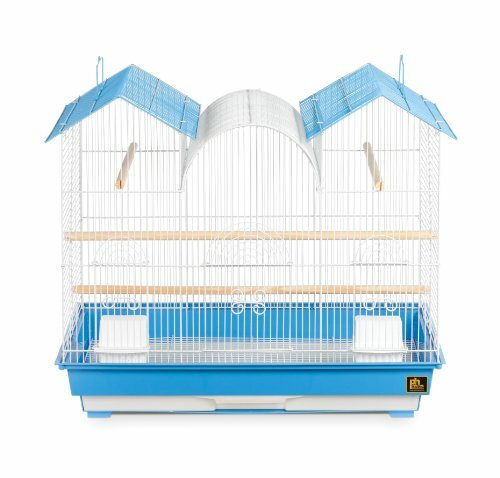 This triple roof bird cage with blue accents is the perfect size to house several parakeets, finches and other small birds or 1 or 2 cockatiels. The removable bottom grill and slide out tray make clean up super efficient and easy. The measurements of this roomy cage are 26”L x 14” w x 22.5” h. The ½” spacing between the wires is plenty of space for them to see through but not get anything caught or stuck. This pretty cage will look terrific in any room thanks to the white wire, blue accent roof lines and unique roof design. 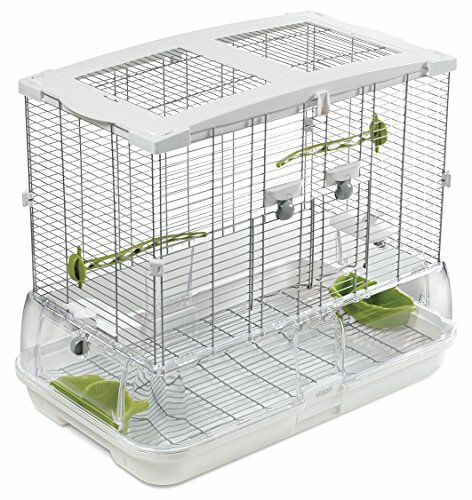 Add toys for them to have activities and you’ll have a spacious, comfortable cage that they will love. The right cage can make your birds really thrive and enjoy their environment. With the room this triple roof cage provides, they will be able to stretch out their wings and not hit the sides of the cage. These top rated bird cages are some of the best on the market and are perfect for small birds and a few medium sized birds as well. Having a sturdy, well designed cage is important to provide protection and comfort for your birds. When they are in a good environment, they are healthier, happier and a lot of fun to interact with. Each of these top rated cages come with perches and food cups, but additional perches and toys can be purchased separately and should be. Birds can easily become bored, so interacting with them and having plenty for them to do is also crucial to a healthy bird. You can learn even more about choosing the right bird cage by reading our buyer’s guide below. It is full of information on learning what features make one bird cage better than another. With all of the choices available, it’s always good to have a detailed resource that can help make that choice much simpler. Why do Birds Need Cages? When you have domestic birds, having cage homes for them protects them from other animals and from getting into trouble. They can get into trouble much like an unattended dog or cat can. Bird proofing a house is very difficult with things like ceiling fans, fireplaces, and so on, so it is never a good idea to leave your bird uncaged for long periods of the day or night; especially when you are sleeping. Sometimes bird owners have bird proofed an entire room and allowed the birds to be loose in that one room, but even that has its risks due to windows or doors that can be left open. With all of the different sizes, styles and types of bird cages available on the market, there is no reason why you can find the perfect cage for your bird or birds that they will love being in. Smaller birds are much harder to keep safe, so if you have finches, parakeets or canaries, they will more than likely be in their cages all the time. If a parakeet is trained, they can learn to come out and sit on a finger or shoulder for short bursts of time. Larger birds such as cockatiels, parrots of all kinds and so on, should not be caged all day every day. They love to interact with people, so getting out every day, exercising and spending time with their humans is very important to their health and happiness. It is important for the owners of large parrots, macaws, cockatoos and other large birds to realize that these birds normally fly long distances in the wild. In a cage they can never fly so that is why it is crucial that they spend a lot of time out of the cage interacting with you and being free to move around freely. You want to provide a clean, entertaining and safe environment for your bird when you choose their cage. It also needs to be big enough for them to move around easily without bumping into the sides of the cage. It’s also more beneficial for your bird if you have more than one so be sure to get a cage large enough to accommodate at least two unless the bird is a large parrot. Birds naturally love to climb, walk, sit and fly. Deciding on how big the cage should be will depend a lot on the type of bird or birds you have. Typically, if you allow for a width that is at least 3 times as wide as the wing spam of your bird, that is going to be sufficient. If you have a large parrot, more than likely they will (and should) spend a lot of time outside of the cage, so they can deal with a little smaller cage for when they need to be contained. Keep in mind that large birds need plenty of time outside the cage. Birds live much longer than other pets, so purchasing a good bird cage with plenty of room is an investment and should be treated accordingly. This is not a cage you will use for only a year or two. Purchase the largest cage you can fit into your home and afford as well. Bar spacing is another issue that needs to be considered and is based on the size of the bird. A wide spacing will work great for a parrot, but not be good for finches. Below we have listed several common bird breeds that people usually have as pets and the minimum cage size that should be considered for that breed. This is a guideline that can be very helpful to ensure that you don’t get a cage that is too small for the birds you want to put in it. When it comes to the shape of your bird cage, it’s recommended that you choose square or rectangular over round. Some birds will feel very unsure and insecure in a round cage because it has no corners for them to go into. Smaller birds like finches and parakeets will need a longer cage so they can fly a bit. In the cases of those breeds of birds, the length is more important than how tall it is. Rectangular is the most ideal shape for flight birds. If you have a large parrot type, then getting a large, square cage with a wide door opening is your goal. The first thing you need to know before beginning your bird cage search is how many birds you will be getting and what breeds. You also need to know exactly where the cage is going to go so you can get the biggest cage you can that will still fit the space you have for it. Avoid putting the bird case in direct sunlit areas such as right in front of a window. You should also avoid drafty places as well. Don’t put the cage in the kitchen wither. Fumes from cooking and cleaning sprays can be hazardous to birds’ sensitive systems. Find a place that is frequently occupied but not the busiest area of your home. This will ensure that the bird can engage in social interaction when he wants to, but can also get peace and quiet if it chooses. In many homes the corner of a living room or den is the perfect place. Bird cages that only have bars that go up and down are difficult for the bird to climb so look for cages that have bars both directions. You also want to pass by overly decorative bird cages and those that are made from wood and wicker; those will just become bird food. You want the cage to be able to be cleaned easily, so look for slide out bottom trays and easily opened doors. Some of the different types of bird cages have deep bases to help with the mess that birds are known for making with their seed hulls, feathers and other debris. Most cages come with a couple of perches for you to put in the cage, but birds love perches and you want to offer plenty of them in your bird cage. They like to be high up so be sure to place a couple of perches high up in the cage for them to sleep on and survey things from. Birds love to bath, so be sure to get a water cup that is big enough to accommodate this or give them some “bird bath” time on a regular basis. If the breed of bird you have needs nest boxes, don’t forget to add one and also add toys, food cups and millet; a special treat that almost all birds love. Don’t put the food and water cups under the perches or the bird’s food and water will have waste in them. You want to make sure the cage you buy is large enough to accommodate the perches, toys and cups and still provide some room to do a bit of flying. You want to get the absolute best bird cage you can get for your money. It will last you for years to come and your bird will get to enjoy it for a really long time. Look for brand names that are well known and have been around for awhile. Many manufacturers have created beautiful bird cages that are simple yet elegant in design. With all of these choices, finding one that will fit the breed you have, the preferences you have and your birds’ needs is not as hard as you may think it is. Birds are really messy at times, but if you stay on top of maintaining your bird cage, not only will your bird be happier, it will be healthier too. Clean the bottom of the cage on a regular basis so waste and seed hulls will not build up. Give your bird fresh water and food daily. The take the seeds out of the shells and usually leave the shells in the bowl, so don’t look at the bowl see it full and think they haven’t eaten. Closer inspection will show that the cup is filled with empty seed shells. Put some grit in the food to help the bird digest their food. A scuttle bone is also beneficial for them. Wipe the bars of the cage down regularly to prevent dust buildup and once a month or so, take the bird out of the cage and deep clean it by hosing it off and then drying it completely. Doing these things will maintain the beauty of the cage as well as ensure a healthy bird. Birds are great companions and providing them with a cage home that they will be happy in is part of being a responsible pet owner. It’s not fair to get a bird, even small ones, and stick them in a cramped bird cage. They can be very enjoyable, entertaining pets that can be taught all kinds of things. With the information you have learned in this buyer’s guide you will be able to sort through the endless designs and styles of bird cage and choose the one that is the right size for your bird’s breed and the right type for your home and preferences as well.